If you're trying to decide whether to add budgies or finches to your life, know they are very different birds. Budgies, or parakeets, require more individual attention from you, so finches are the better choice if you just enjoy watching birds. You can easily keep both species at once, as long as they're in separate cages. It's hard to mistake budgies for finches. Long-tailed parakeets come in a variety of colors, including yellow, green, blue, violet, gray, white and many mutations. They average about 7 inches long and have a slightly upright stance. Above your parakeet's beak you'll notice a raised area with two holes. That's the cere, and those holes are the nostrils. While an adult male parakeet's cere is blue, a female's is pink or brownish. Finches usually mature to about 4.5 inches long. Common short-tailed pet finch species include black, white and gray zebras; multi-colored Gouldians; and hybrid, black, brown and white society finches. Zebra finches have pointed, orange beaks, brighter in color in males. Gouldian finches have light-colored beaks, while the beak of the society finch is a darker shade. 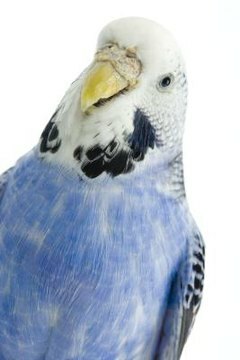 If you want to interact a lot with your bird, a budgie is a better choice than a finch. You can hand-tame your parakeet, which isn't possible with the much wilder and tinier finch. Parakeets imitate a lot of noises, so you'll hear whistling and singing in your house. Some budgies will repeat words. Finches generally don't like handling, but they can fill your home with their songs. However, they don't talk. Most finches are gentle birds who get along with others of their kind. While it's preferable to house parakeets with a companion, it's really a necessity for finches. Single finches don't do well, so keep a pair at minimum. Because they are so small, you can keep several finches in a reasonable-size cage. If you keep mixed pairs but don't want babies, simply remove any eggs. A budgie's cage should be at least 18 inches long and high. Provide your budgie with perches no larger than 3/4 inch in diameter. Parakeets like toys, so provide your pet with playthings. Buy the biggest cage you can afford for your finches. It should be wider than it is high, so your birds can fly around and exercise. You should also include a nest box, filled with grass, for your finches' bed. Use softwood branches, not treated with pesticides, for perches. For either type of bird, place a small bowl of water in the cage every other day for bathing. Remove it after a few hours. You can keep parakeets and finches in outdoor aviaries if you live in a warm climate. While you can parakeet-proof a room, closing doors and windows, and let your budgie out for some flight time, don't try it with finches. They are too small and nervous and almost impossible to catch once out of the cage. Feed your birds a high-quality commercial diet designed for them -- don't purchase finch food for parakeets and vice versa. Both species always require access to clean, fresh water. They also need a cuttlebone in their cage to meet their calcium demands. Both budgies and finches enjoy small amounts of fruits and veggies as part of their daily diet. Feed these in a separate dish from their feed bowls. A parakeet can live for 10 years or more, although 5 to 7 years is the average. The oldest parakeet on record lived in England, dying at the age of 29. With good care, a finch might live for 7 to 10 years. Society finches might live as long as 13 years, with individuals living as long as 20 years.